Figi's® Chocolate Greetings. 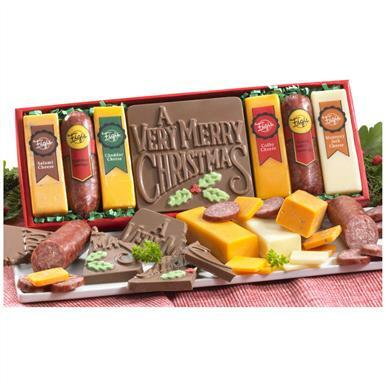 Nothing says Happy Holidays as deliciously as chocolate, sausage and cheese. The gift that pleases everybody! Sweet milk chocolate candy, with snack-sized cheddar and colby cheese, and zesty flavored summer sausage. Foiled chocolate domes complete this rich gift. 13 ozs.